A fascinating look at modern Russia focusing on the use of popular television programming to advance the political and social agenda of the state by the Russian president, and the network of Oligarchs whose influence shape the culture and economy. The author draws on his own experience working in Russian television, interviews with a former gangster turned Oligarch/action movie producer, a fashion model/aspiring trophy wife, and a fabricated "opposition party" that is used to provide the veneer of fair elections, but in reality serves to reinforce the image of stability and power of the ruling party. The book illustrates a nation where post-Soviet new-money elites revel in gilded opulence, while everyone else is afforded cold, often brutal institutional nihilism. 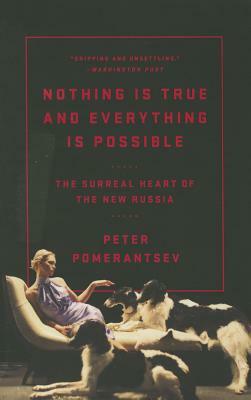 Peter Pomerantsev is an award-winning contributor to the London Review of Books. His writing has been published in the Financial Times, NewYorker.com, Wall Street Journal, Foreign Policy, Daily Beast, Newsweek, and Atlantic Monthly. He has also worked as a consultant for the EU and for think tanks on projects covering the former Soviet Union. He lives in London.